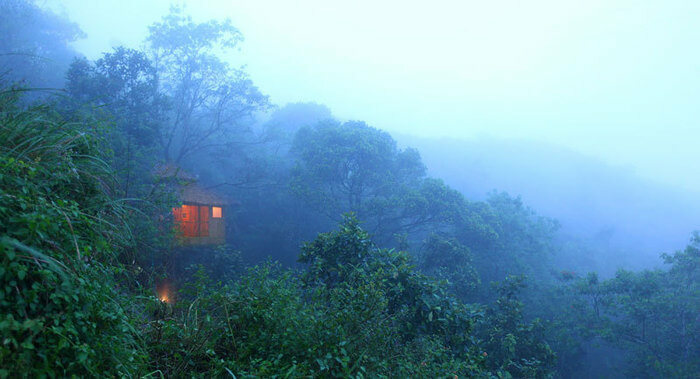 Treehouses in South India are perched right in the middle of vast plantations or lush wilderness of the Western Ghats. 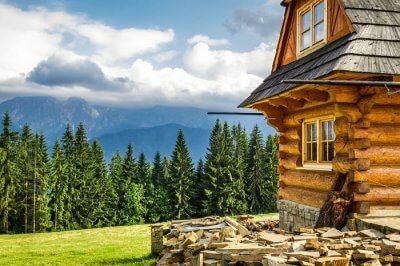 Most of these properties offer other kinds of accommodation as well (villas & cottages) but tree houses offer intimacy with nature like none other. 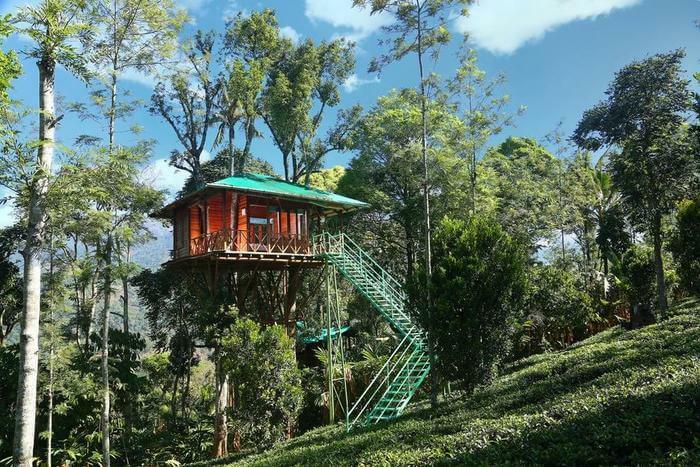 The best treehouses in South India are clustered in Kerala and have the best facilities you can imagine. Here’s the list of top treehouse resorts you should look at, along with their location details, traveler reviews and more. 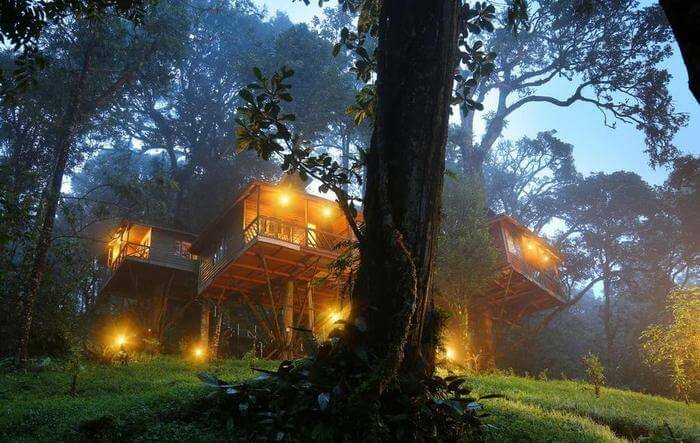 Vythiri Resort in Wayanad is rated top among the best treehouse resorts in India. 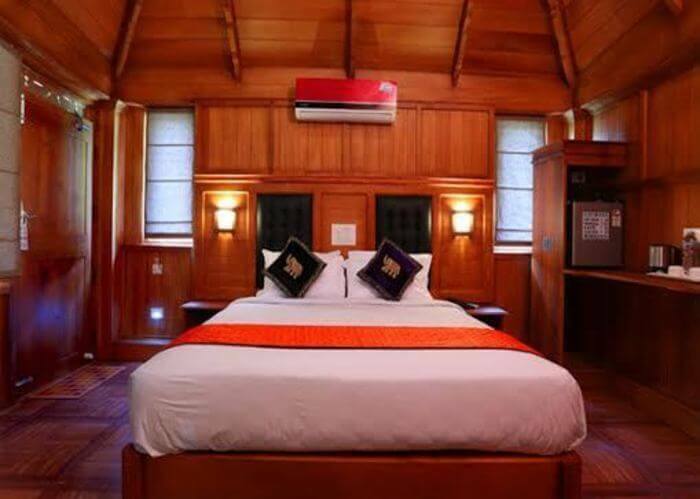 It offers treehouse accommodation along with villas and has adapted the essence of nature in a luxurious property. 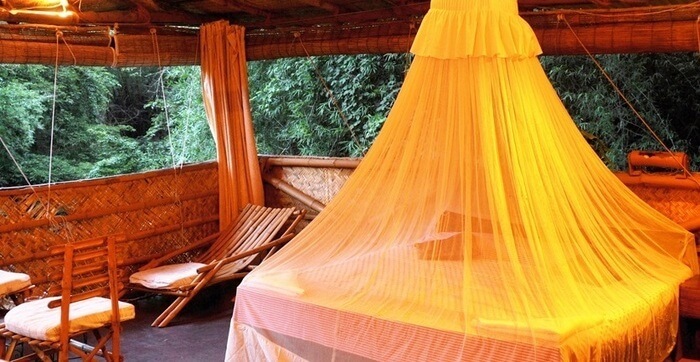 Surrounded by rainforest, there are five tree houses with thatched roofs and bamboo walls. And when you’re cross the wooden hanging bridge above the natural spring, you realize that this place as surreal as it gets. Vanya Treehouse is more than just a stay, it’s an experience to cherish as you stay in one of the best places to visit in Kerala. Settled amidst the mist-laden Western Ghats, the property is adjacent to Periyar Forest. It spread in 12 acres in virgin forestland that makes it a delight for nature lovers. Authentic and lip-smacking Kerala cuisine is cherry on the cake and leaves you craving a few more days in this haven. 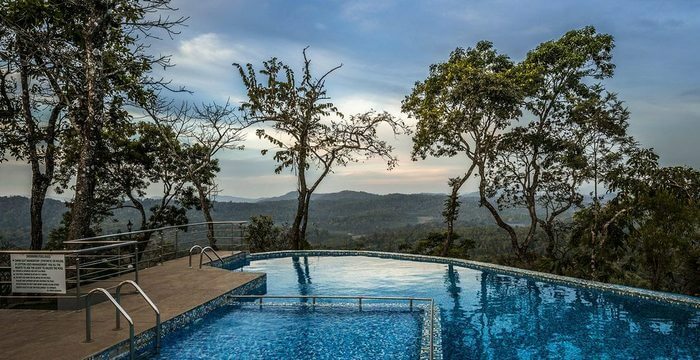 A beautiful property spanning across 400 acres, Tranquil Resort is located amid private coffee and spices plantation tucked away in Wayanad’s lush rainforest. 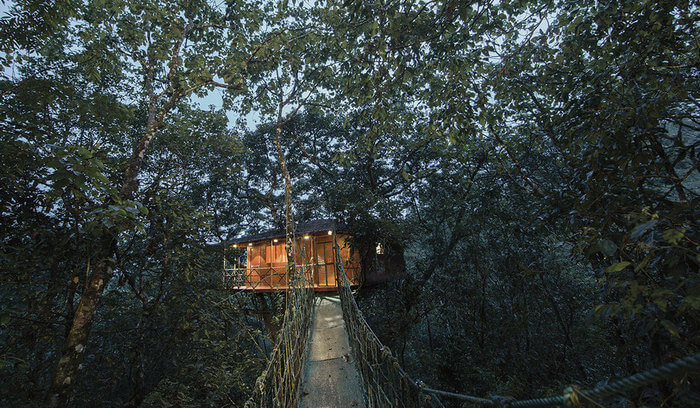 The resort features two tree houses and seven rooms, all of which assure incredible intimacy with nature. This is an award winning plantation homestay and guarantees a recharging retreat for your senses on your trip to Kerala. Must Read: 15 Best Villas In Kerala & Finest Homestays That Take You A Step Closer To Nature! 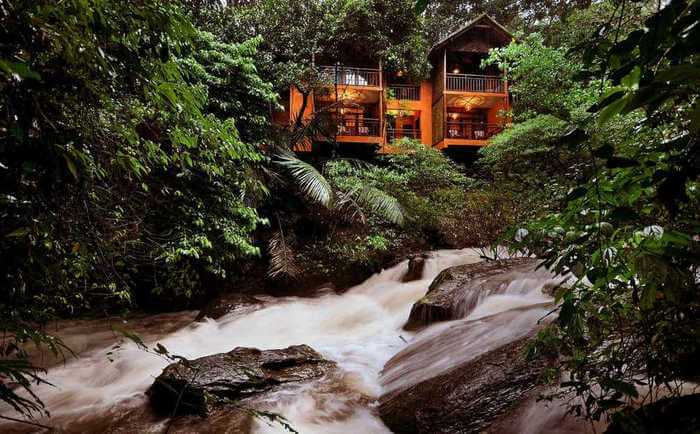 One of the best treehouses in South India, The Nature Zone Jungle Resort in Munnar is a jungle retreat where you can disconnect from the city humdrum. Enjoy an amazing stay amidst evergreen mountains without having to compromise with luxury. 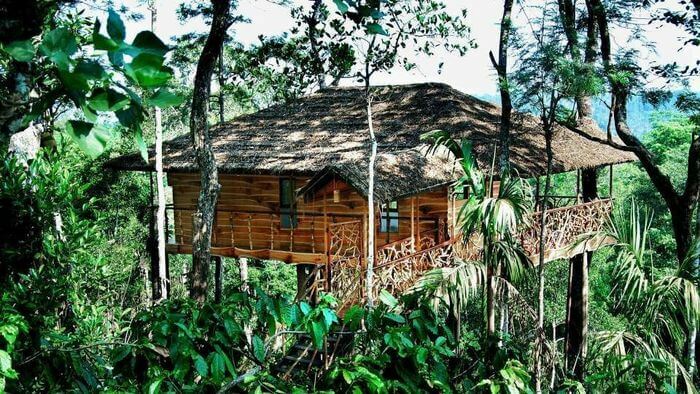 The treehouses look simple on the outside but on the inside you have craftily decorated rooms with delicately accommodated tree trunks. 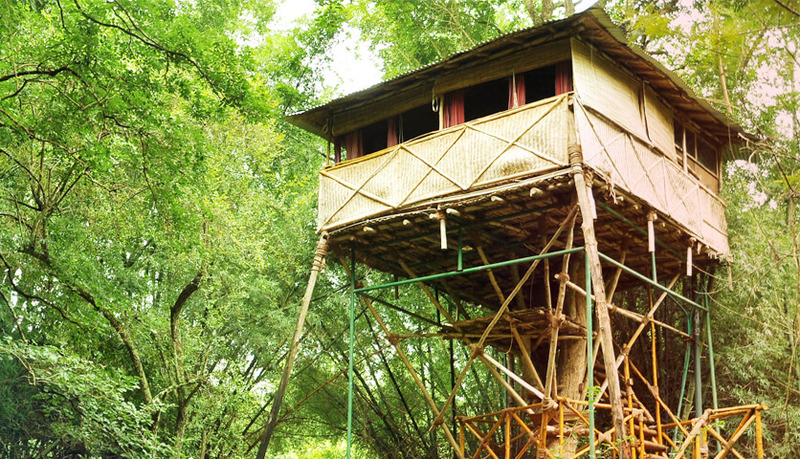 Built along 30-feet high trees, the Rangerwood Machan is in close proximity to Periyar Tiger Reserve. 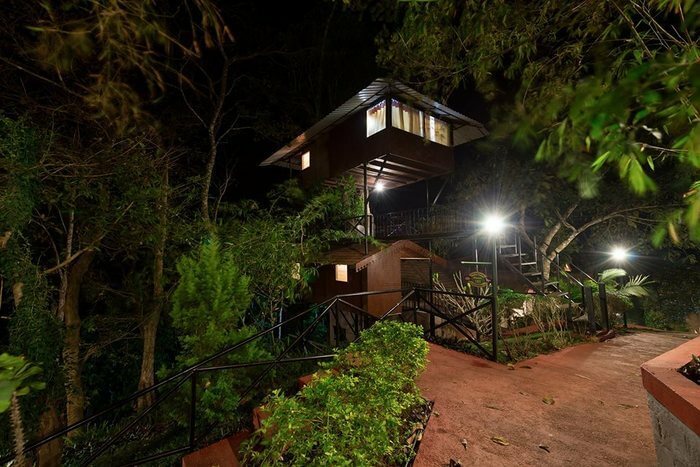 There are two tree houses with separate balconies and entrances, ensuring complete privacy. Bamboo and wooden staircases lead to houses that merges with trees and the greenery around. 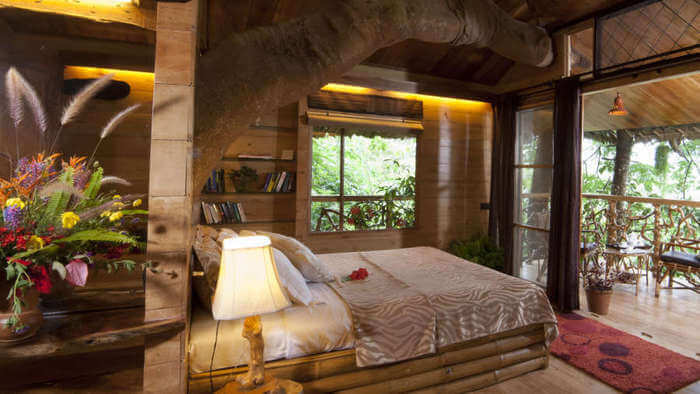 Interiors designed with woodcraft make it one of the loveliest treehouses in South India. Rainforest Treehouse is snuggled in the Sholayar rainforest and offers views of the Niagara of Kerala – Athirapally Falls right from the comfort of your room. 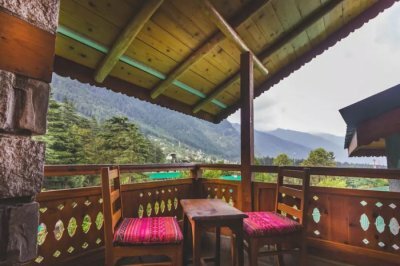 Just snuggle in your bed with silk quilts and complete quietude, you might hear the roars of Asia’s largest waterfall and the chirps of colorful birds. The Dream Catcher Resort is settled amid 20 acres of tea, cardamom and orange plantation. Even though there’s thick plantation all around, the wifi connection is strong and you stay connected with the world while connecting with nature. Recharging with Ayurveda is among the best things to do in Kerala, so make sure you book an hour in the in-house spa that offers relaxing Ayurvedic therapies and treatments. Dedicated wholeheartedly to ecotourism, the Porcupine castle spans over an area of 300 acres and is surrounded with coffee plantation and miles of rolling hills. The area is also home to a rich birdlife, so expect to spot some White Bellied Treepies, Blue-Winged Parakeets, and Great Pied Hornbills. 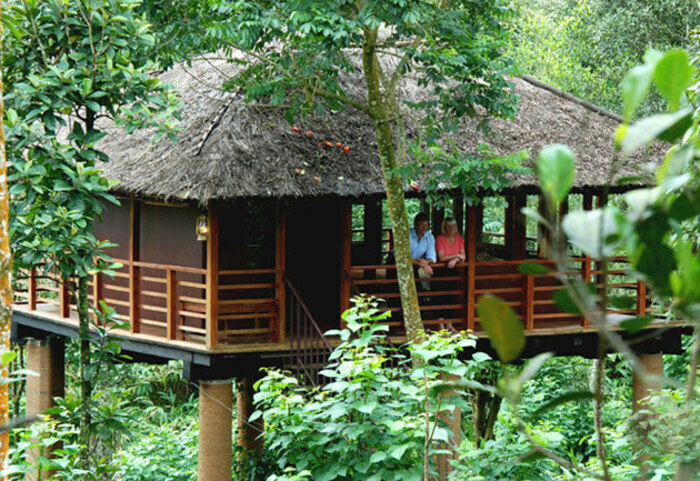 The lofty treehouses of Carmelia treats you with a fragrant stay adorned with bushes and plantations. An organically prepared cup of hot tea matches well with an evening in the verandah of the thatch-roof treehouse. The interiors reflect the local culture, modernity, and a flourishing ecosystem that surrounds the property. Safari Land Resorts is a retreat located close to Mudumalai Wildlife Sanctuary. The property is located near Ooty, on the foothills of Blue Mountains of Nilgiris. 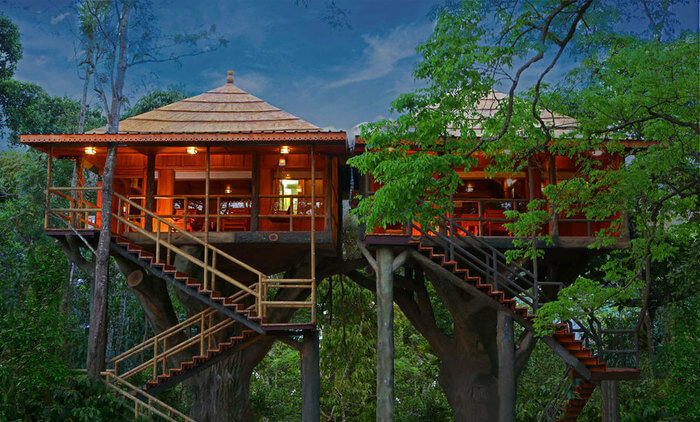 There are five treehouse categories, namely – Twin Tree House, Exclusive Tree House, Skyscraper Tree House, Family Tree House, and Honeymoon Tree House. 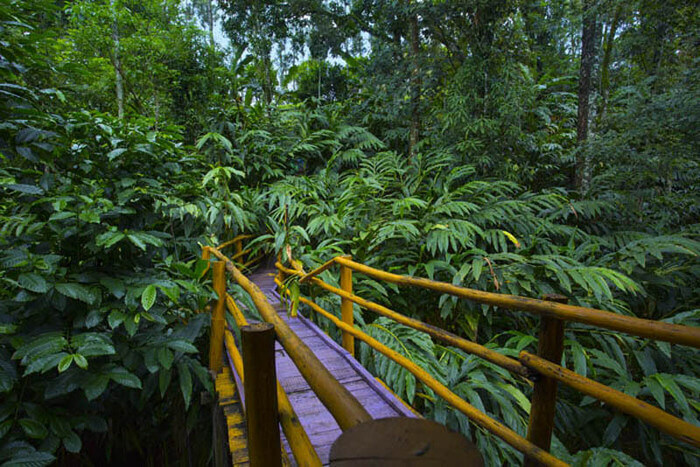 Each of these treehouses have their own distinctive features while some offer view of the stream along with jungle’s soulful landscape. 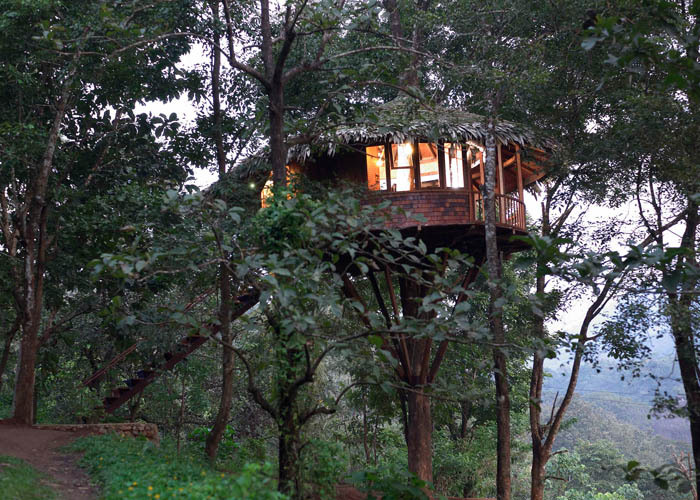 So these were the most magical treehouses in South India. 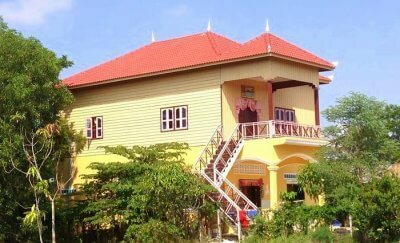 Do you know about more such delightful properties?! Let us know about your experience in the comment section!